Those who work in the government relations industry know, policy focus and fervor changes with each new administration. Lobbyists must demonstrate their adaptability to changes in the political climate—to get the job done no matter who is at the helm. So, how do association lobbying trends vary over time? When a new head of state is in the White House, what changes in the association advocacy space? Are you curious? Association TRENDS was too. 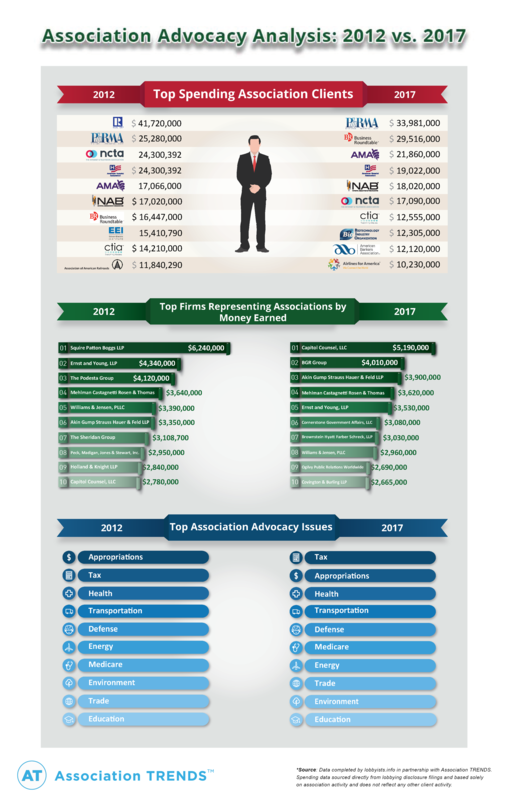 Through Lobbyists.Info, the one-stop resource for information on lobbying and government relations, we pulled data directly from LDA disclosure forms filed with the Clerk of the U.S. House of Representatives for the full years of 2012 and 2017 to see what associations spent the most money on outside counsel, which lobbying firms receive the most money from associations, and which issues are most frequently registered for by associations. Here’s what we found out. *Source: Data completed by lobbyists.info in partnership with Association TRENDS. Spending data sourced directly from lobbying disclosure filings and based solely on association activity and does not reflect any other client activity. This entry was posted on Friday, May 18th, 2018 at 8:29 am and is filed under Lobbying News by Allison Rosenstock. You can follow any responses to this entry through the RSS 2.0 feed. Both comments and pings are currently closed.